A truck’s large size often makes it difficult to drive in snow and ice without additional accessories. It’s therefore important to have your truck ready for winter driving before bad weather actually hits. Many winter accessories for trucks are available as aftermarket parts, including snowplows, snow chains, traction weights, ski racks and snow shades. The best choice for a snow plow often depends on the amount of plowing you plan to do. A snowplow intended for commercial use is typically made of steel for greater durability. A snowplow made of aluminum is more suitable for personal use due to its lower weight. Regardless of construction material, all snowplows should have a cutting edge made of heavy-duty rubber to protect the plow from scrapes against hard surfaces such as asphalt, bricks and concrete. The supports should also be made of steel, even if the blade itself is made of aluminum. Many snowplows have a front-mount hitch receiver that allows a hitch to be attached to the snowplow. Snowplows for personal use typically must be raised and lowered by hand. The warranty for an aftermarket snowplow is usually in the range of 2 to 5 years. Driving a truck on black ice can be extremely hazardous without snow chains. Snow chains that are specifically designed for this purpose are different from ordinary chains, also known as cable chains. 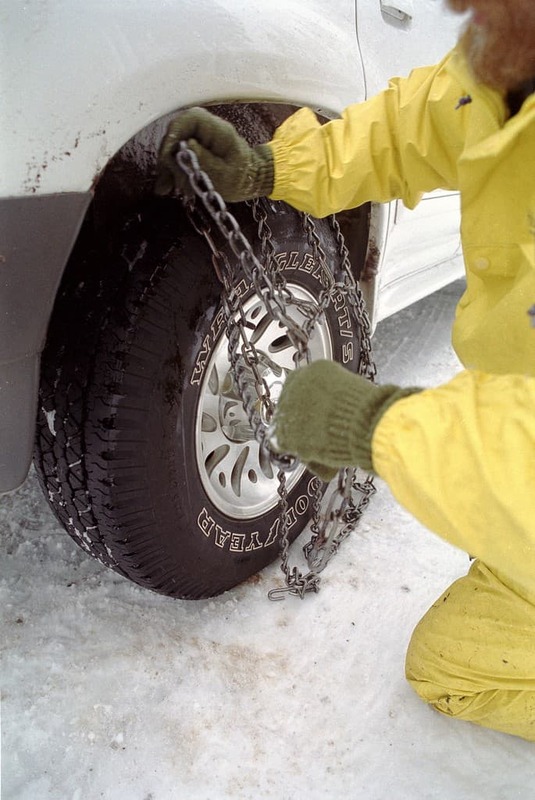 The links in snow chains are twisted, causing them to cut into ice under pressure. These changes should be constructed of carbon steel for greater durability. Snow chains are primarily purchased according to tire size and are commonly available for large trucks. Most snow chains will also fit vehicles with limited clearance, formally known as type S vehicles. They will typically comply with any legal requirements for the state in which they’re sold. The lack of adequate traction is one of the most common problems with driving a truck in snow. A traction weight is placed in the truck bed directly over the rear axle to provide maximum traction. Simple weights such as cinder blocks, boulders or sandbags aren’t ideal for this purpose for a couple of reasons. These weights can damage the truck bed when placing them into the bed, and they may also slide out of position while driving. Furthermore, these weights must be removed by hand when they’re no longer needed. A popular solution to this problem is to use a bladder that can hold enough water to provide the necessary traction. Traction weights should typically weigh in the range of 400 to 500 pounds, depending on the truck’s size and driving conditions. This bladder should be made of heavy-duty vinyl and reinforced with nylon mesh to ensure sufficient durability. Ski racks are popular aftermarket accessories for truck owners in cold climates. Traditional racks use latches, knobs, tie-downs to secure skis and snow boards into place. However, the latest models use pushbutton openers that easily release the skis, even if you’re wearing gloves. The jaws of the ski rack should be lined with rubber molding that will secure the skis without damaging them. Many ski racks are often equipped with locks for protection against theft. Capacity is often the deciding factor when purchasing ski racks, with the most common options including two, four or six pairs of skis. Ski racks typically hold a smaller number of snow boards due to their greater width. A snow shade helps to keep snow and sleet from accumulating onto a truck’s windshield, thus preventing the need for scraping. They’re typically made of multiple layers to ensure maximum effectiveness. The outer layer is often made of aluminum foil or mesh to keep snowflakes from sticking together. A snow shade’s inner layer is typically made of vinyl to form a seal against the windshield, preventing snow and sleet from getting between the snow shade and windshield. Snow shades are often made for a particular model of truck to ensure the best possible fit. They typically come with carrying cases, allowing them to be easily rolled up and stored when not in use.